Maryland Governor Larry Hogan (R) is expected to sign a bill Tuesday that will license direct-entry midwives and make it legal for them to attend to home births. The number of births that take place outside of a hospital setting spiked by 60 percent between 2004 and 2012, according to the Centers for Disease Control and Prevention. Maryland Gov. Larry Hogan (R) is expected to sign a bill Tuesday that will license direct-entry midwives and make it legal for them to attend to home births. Maryland was one of six states that forbid midwives from helping mothers give birth at home unless the midwife is a nurse. Advocates have pushed for legislation to change this law for many years, but opposition from medical groups and concerns about safety had prevented it from gaining traction in the state’s Democratic-majority legislature. Around the country, the number of births that take place outside of a hospital setting spiked by 60 percent between 2004 and 2012, according to the Centers for Disease Control and Prevention (CDC). 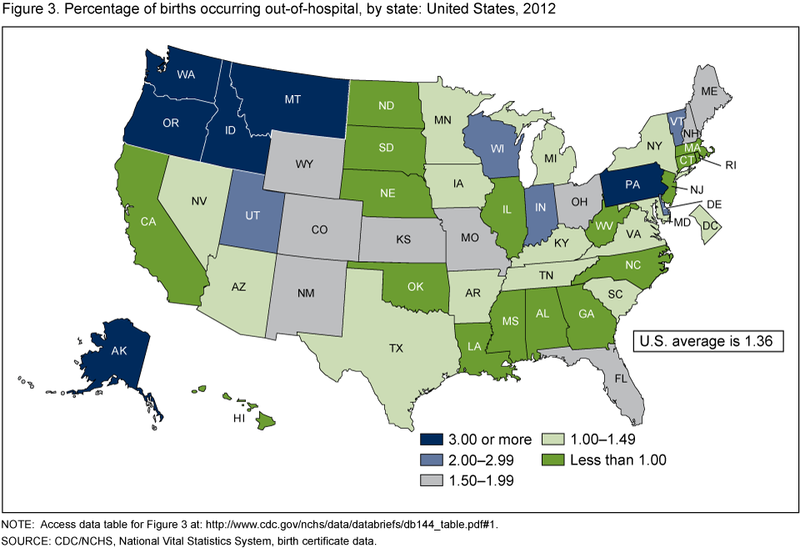 Currently, somewhere between 1 and 1.5 percent of all Maryland births occur out of the hospital. Proponents of changing the state’s law argued that these women and the midwives that help them have few legal protections. They believe that changing the law to allow for licensed certified midwives—as 28 other states have done—could enhance safety through education and regulation and give everyone involved legal protection. Groups representing doctors, nurse-midwives, and nurses had previously opposed similar laws, as had the state’s health department, but the bill introduced this year included compromises on many issues that had been at the center of legislative disagreement. The bill set specific education requirements for certified midwives, noted which health conditions precluded home birth, and explained when and how midwives would transfer care to another medical professional if they encountered problems during delivery. The sticking point this year was related to what is known as vaginal birth after cesarean section, or VBAC deliveries. It used to be settled science that once a woman had a c-section section, all future births would be by c-section to reduce the risk of uterine tearing. New surgical procedures, however, have made this risk much lower and allowed some women to have a vaginal delivery with their next pregnancy or pregnancies. Fear remains that VBACs are more dangerous and many in the medical profession are against VBACs attempted outside of a hospital. “We understand that women are going to make that choice and deliver at home, and that’s their right,” she said, adding that medical groups weren’t going to agree to the bill unless VBACs were excluded. To get the bill to move forward, both sides agreed that VBACs would be prohibited for now. But the bill requires a committee to report on the safety of such deliveries and leaves open the possibility that the law could change. Delegate Ariana Kelly (D-Montgomery County), who sponsored the bill in the house, was not surprised by the contention. She told the Baltimore Sun: “Medical licensing bills are brutal. They’re turf wars.” Once the last compromise was reached, however, the bill, HB-9, was passed unanimously by both the house and the senate. Birth has become dangerously medicalized for them. 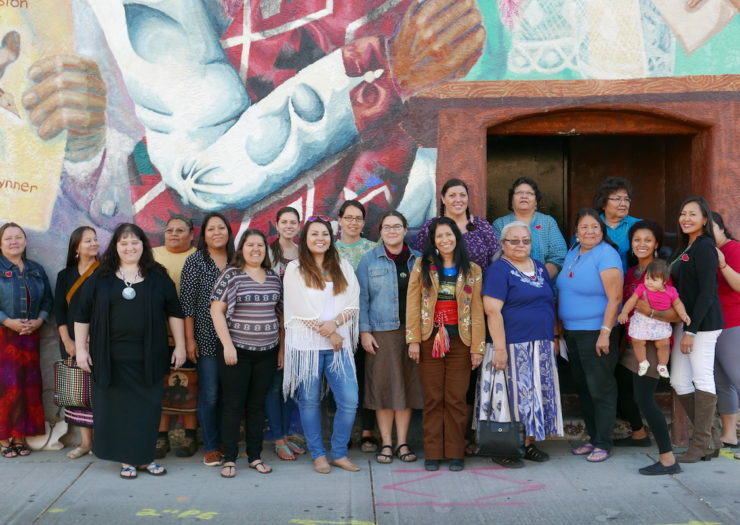 Group of participants in the annual Indigenous Midwife Gathering in Albuquerque, New Mexico, 2015. Aboriginal or indigenous midwifery is seeing a resurgence as conventional health-care policies in hospital and clinics perpetuate an environment in which most contemporary pregnant Native women are considered pathologically unhealthy. “The mainstream medical narratives surrounding Native women depict moms who don’t breastfeed and don’t have partners. According to this portrayal, Native women don’t exercise, eat poorly, and have diabetes. We are seen as hopeless,” said Marinah Farrell, an indigenous Chicana certified professional midwife based in Phoenix. “When I worked in the hospital, I saw so many Native mothers who would hemorrhage and have terrible outcomes during their births. It seemed so abusive; they were treated like they were sick already when they entered the hospital doors,” said Rebekah Dunlap, a member of the Fond du Lac Band of Ojibwe who works as a doula and is a registered nurse, bachelor of science nurse, and public health nurse in Minnesota. What began quietly as the efforts of a few dedicated women has in recent years grown in size, scope, and agility. Today, Native women across the United States and Canada are putting their skills to work in challenging the status quo of mainstream medicine. Birth has become dangerously medicalized for them. Cut off from traditional diets, support networks, and community midwives due to colonization and assimilation, many Native women have chronic health conditions that mean giving birth is a high-risk activity—and one that requires travel to well-equipped hospitals. Many indigenous women in the United States and Canada give birth in governmental health facilities overseen by Indian Health Service (IHS) in the United States, and First Nations and Inuit Health Branch in Canada. Health-care policies at IHS and First Nations and Inuit Health are comparable to those at conventional health-care facilities in both countries. Aboriginal or indigenous women, especially those in the United States, are overwhelmingly classified as high-risk. In Canada, according to Statistics Canada, birth outcomes among indigenous peoples are consistently less favorable than among the non-indigenous population. Native American and Alaska Native women have higher rates of maternal morbidity or injury compared to the general population, according to the Centers for Disease Control and Prevention (CDC). The risk of maternal death for Native women is twice that of white women in the United States. The infant mortality rate for Native American and Alaska Native babies is .83 percent, second only to rates for non-Hispanic Black American babies of 1.13 percent. The practice of forcing Native women to travel to hospitals because their traditional ways of caring for pregnant people were outlawed contributes to an endless cycle of poor outcomes. Despite the public health industry’s best attempts at addressing Native women’s high-risk status, this cycle can’t be addressed by the same Western-style institutions that are complicit in perpetuating the problems in the first place, according to indigenous midwives including Katsi Cook of the Mohawk Nation. For instance, governmental policies such as forced attendance at Indian residential schools in Canada and Indian boarding school in the United States were explicitly intended to eradicate and denigrate indigenous cultures, languages, and ways of healing and birthing. Many children in these schools were subjected to sexual and physical abuse and denied access to their families, thus creating generations of untreated post-traumatic stress disorder or historical trauma. After being cut off from families and traditional lifestyles and foods, which some suggest offer nutritional benefits, indigenous peoples began developing high rates of diabetes and poor health outcomes, such as high rates of lung, chest, and intestinal disorders. Forcing Native women to birth in hospitals is another in a long line of colonial acts of violence, explained Kanahus Manuel, a member of the Neskonlith Indian Band of Secwepemc Nation in British Columbia, Canada. “Birth is the ultimate act of decolonization and resistance,” she said. The efforts of indigenous midwives in Canada and the United States run a wide spectrum of styles and practices. However, according to Nicolle Gonzales, Navajo nurse-midwife, “Indigenous peoples share a worldview of connection to the land. We view birth and motherhood as ceremony,” she said. “Traditional midwives took time to sit and talk with the mothers about their lives, families and challenges,” Dunlap noted. “Our women were given time and support to have their babies; there was no agenda dictating the various stages of labor,” she said, drawing a clear distinction between birthing experiences at hospitals versus in Ojibwe communities. According to the American Pregnancy Association, there are three stages of childbirth including early labor when the cervix moves toward complete dilation of 10 centimeters, active labor when the baby is delivered through the fully dilated cervix, and third stage which includes delivery of the placenta. The first stage of labor is usually the longest period and can last from a few minutes to many hours. Among indigenous peoples, as birthing women moved through the stages of labor, they were fed certain foods to provide physical, emotional, and spiritual strength. When the baby was born, its feet touched the earth even before it was given to the mother. “All of these ways had important meanings that are not yet completely lost,” she said. Cook has influenced and inspired generations of midwives to embrace their traditional Native ways. “I have a long tail in championing indigenous midwifery extending back to when I was first pregnant in 1973,” Cook said. Cook has worked as an indigenous women’s health and midwifery advocate for many years. In 1983, she helped create a “Birthing Crew” of local elders and midwives on her home reservation of Akwesasne in New York and Canada. The crew provided midwifery services and health education to tribal members. In 1985, after the nearby St. Lawrence River was polluted by polychlorinated biphenyls (PCBs) from General Motors, Cook established the Mother’s Milk Project. A study found PCB contamination of breast milk of Mohawk women who ate fish from the St. Lawrence River. Today, Cook’s many devotees and students continue taking up the challenge to revitalize indigenous midwifery. Aboriginal midwife Kanahus Manuel is a self-proclaimed warrior, freedom fighter, and well-known indigenous land and water protector. Manuel was pregnant with her first child while opposing the Canadian government’s plan to build facilities for the 2010 Winter Olympics on Secwepemc lands. When she learned that authorities had issued a warrant for her arrest for these activities, she fled to the Marble Mountain range deep in Secwepemc territory when her time came. “I knew I wanted an unassisted birth as my ancestors have done for centuries; I didn’t want to have my baby in a prison cell,” she said. She educated herself in both mainstream and traditional birth practices and has since birthed all four of her children in the Secwepemc way, at home attended by family and/or midwives. For Manuel, revitalizing indigenous midwifery is a declaration of sovereignty over women’s bodies and autonomy from colonial governmental systems. Other advocates are finding ways to work within the systems to revive Native birth ways. Gonzales is working within U.S. medical laws and regulations to create what will be what she describes as the first Native culturally focused birth center on tribal lands. Founder and executive director of the New Mexico-based Changing Woman Initiative, Gonzales received her bachelor’s of science in nursing and master’s degree in nurse-midwifery from the University of New Mexico and is a member of the American College of Nurse-Midwives and certified with the American Midwifery Certification Board. Although eligible to practice in a conventional hospital, Gonzales envisions creating a birthing environment that is friendly and welcoming and where Native women can have ceremony, eat traditional foods surrounded by family, and reclaim their traditional ways of birthing and healing. According to the CDC, in 2015, 98.5 percent of births in the United States occur in hospitals. Out-of-hospital deliveries represented 1.5 percent of births in 2015. Of the more than 61,000 out-of-hospital births, 63 percent occurred at a home and 31 percent at free standing birthing centers. However, most insurance companies don’t cover home births and may only offer limited coverage at birthing centers. Gonzales hopes she can establish Medicaid certification for the birthing center they are building and establish other ongoing funding in order to offer services for women who may lack other health insurance. She and her supporters and co-workers at Changing Woman Initiative equate Native women’s rights to birth in their own ways as inherent and inalienable rights affirmed by the United Nations Declaration on the Rights of Indigenous Peoples. They hope to complete the birthing center, on the Pojoaque Pueblo, north of Albuquerque, this year. Gonzales and her colleagues argue that although the Indian Health Service is tasked with providing health care to Native Americans, it is unable to effectively meet its mission. IHS is the federal agency within the federal Department of Health and Human Services that is charged with meeting treaty agreements between federally recognized tribes and the U.S. government, which promises to provide tribal members with health care. These promises have their base in Article I, Section 8 of the U.S. Constitution governing duties and powers of the Congress. Criticism of the type of health care offered by IHS, however, could be lodged against other conventional health-care facilities in the United States that are also subject to the same limitations and laws regarding types of services that can be offered. A statement provided by the Phoenix Indian Medical Center indicated that it employs ten certified nurse-midwives who provide culturally sensitive and relationship-based services. According to the statement, the health center provides pregnant people with therapeutic massage, hydrotherapy, and lactation support. Gonzales, however, argues that although IHS insists it offers culturally sensitive birthing practices, most of the midwives are non-Native and the facilities are still governed by the same strict hospital-style protocols as its mainstream counterparts. So no matter where a Native pregnant person might reside, their access to culturally sensitive care will be limited, if nonexistent. Birthing mothers are restricted regarding food consumption and the use of open fires, and ceremonial food preparation is restricted. Aboriginal midwifery in Canada, however, has long been recognized by mainstream organizations such as the College of Midwives of Ontario. The college, responsible for registering midwives in the province, declared in a 2001 vision statement that midwifery care in Ontario, including aboriginal midwives, was defined by ongoing support for community-based midwives working in partnership with childbearing women. Aboriginal midwifery is seen as a valuable way not only to improve patient and infant health outcomes, but also as a means to help reverse overall health disparities among Native peoples. In 1994, many Canadian provinces added a special exemption to the Canadian Midwifery Act. It allows aboriginal midwives who provide traditional midwifery services to tribal communities to practice without registering with the Regulated Health Professions Act. The act varies by province but requires midwives to complete a set of mandatory courses and abide by the rules of the act. Aboriginal midwives can practice legally without accreditation under the often-rigorous demands imposed by the act. “Indigenous midwifery and healing practices are keystones in addressing reproductive health and longstanding problems in communities such as addiction, disease, shame and trauma,” said Cook, who helped create the 1994 exemption. Preliminary data and evaluations indicate that birth outcomes have improved since the exemption was added. For instance, Inuulitsivik Health Centre’s Midwifery Service in Nunavut territory has provided care by traditional Inuit midwives to clients since 1986. According to research funded by Health Canada and published in Birth Issues in Perinatal Care, findings indicated low rates of intervention for births despite the high-risk designation of many Inuit mothers. Ninety-seven percent of births were documented as spontaneous vaginal deliveries; Inuit midwives attended 85 percent. Midwifery in the United States, however, is not as accepted as in Canada. Laws governing its practice vary greatly from state-to-state. Only certified nurse midwives (CNMs), not other midwives, can practice legally in all 50 states. They are afforded hospital privileges in 30 states. After earning a bachelor’s degree in certified nursing, most CNM candidates also complete graduate studies in programs certified by the American College of Nurse-Midwives. Some midwives may practice under other designations, including direct-entry midwives, certified midwives, or certified professional midwives, who may work in birthing centers and/or help with home births. Training for and attainment of these titles varies from state to state. In some states, many midwives run the risk of arrest for practicing medicine or nursing without a license. For most women in the United States, the path to childbirth begins with a trip to a traditional hospital. Native mothers frequently must travel great distances from rural home communities and frequently can’t afford to bring along family or other support people. More insidious, however, according to indigenous midwives, is the impact of ongoing trauma from sexual assault as well as unresolved historical trauma created by U.S. federal policies designed to separate Native peoples from their lands, cultures, and languages. According to the Department of Justice, Native Americans are 2.5 times more likely to experience sexual assault compared to other ethnicities. One in three Native women reports having been raped in her lifetime. The hospital environment with its rigorous, sterile protocols forbidding food; regulations regarding the number of visitors; agendas dictating when to induce birth or perform cesarean sections seem like another in long line of traumatic events. According to Cook, Native peoples won’t be healthy and whole until Indigenous midwifery, which helps to combat trauma affecting poly-victimized people, is restored to their communities. In that vein, Dunlap and a handful of other Native women in her area are creating a local effort to spend time with traditional midwives and healers and encourage expectant people to learn more about their Ojibwe birthing ways. “Our Ojibwe stories describe how the fathers would keep a fire burning while the woman birthed so the baby’s spirit could find its way.” Having a prescribed role for the father provides him with a sense of connection and purpose with the birth. “For Ojibwe, birth is a ceremony; baby is on a spiritual journey before they actually arrive,” Dunlap said. “We have ancestral knowledge that Ojibwe women can share with each other,” she added. The reclamation of indigenous women’s medicine is a true grassroots endeavor, Cook pointed out. “In indigenous communities, health begins at home, at the kitchen table, using the everyday language of everyday people,” she said. CORRECTION: This piece has been updated to clarify Kanahus Manuel is a member of the Neskonlith Indian Band. A previous version of the piece also listed Rebekah Dunlap as her online pseudonym R.A. Mackelberry. Evidence-based journalism is the foundation of democracy. Rewire.News, is devoted to evidence-based reporting on reproductive and sexual health, rights and justice and the intersections of race, environmental, immigration, and economic justice. As a non-profit that doesn’t accept advertising or corporate support, we rely on our readers for funding. Please support our fact-based journalism today. BALTIMORE — This city has opened a new front in its effort to give black newborns the same chances of surviving infancy as white ones: training doulas to assist expectant mothers during pregnancy, delivery and afterward. The initiative is the latest salvo in the Baltimore City Health Department’s seven-year-old effort to combat high mortality rates among black newborns. Other cities may follow, according to Dale Kaplan of the MaternityWise Institute, which conducts doula training in Baltimore. Other cities, including Denver, San Antonio and San Francisco, have contacted his organization to inquire about starting programs. The U.S. infant mortality rate among African Americans is more than twice as high as it is for white babies. A 2013 study found that doula-assisted mothers were less likely to deliver babies with low birth weights or with birth complications than were mothers who opted not to receive such support, and they were more likely to breast-feed their infants. Another study found that mothers attended by female caregivers during labor were less likely than others to have Caesarean births, require painkillers or deliver babies in poor health. “Continuous one-to-one emotional support provided by support personnel, such as a doula, is associated with improved outcomes for women in labor,” according to the American Congress of Obstetricians and Gynecologists, which cites other benefits, such as shortened labor, less need for pain medication and fewer operative deliveries. African American women have a long history with doulas, particularly during the Jim Crow era when hospitals denied access to black women, forcing many to deliver their children at home, said Andrea Williams-Salaam, a doula trainer in the Baltimore program. But as race-based legal barriers vanished and the medical profession strongly promoted hospital deliveries as the safest option, fewer women practiced as doulas. While a few continued to work in Baltimore, she said, the city decided to start training doulas, following the example of New York, which started its doula program in 2010. So far, New York has trained 68 doulas who have attended 580 births. Gabriela Ammann, director of the By My Side Birth Support Doula Program, which seeks to reduce infant mortality in Brooklyn, helped start the New York program. She had been a part-time doula while teaching infant education classes in the Brooklyn Healthy Start Program. Ammann started connecting some of those expectant mothers with doulas she knew. She persuaded the city to formalize the program and to train new doulas. Like New York, Baltimore wants its doulas to work as independent contractors rather than as city employees. In addition to advising women about their pregnancies and baby care, Baltimore’s doulas will be trained to connect needy women to housing, transportation, nutrition and employment services. It was the idea of empowering other women that induced Keyona Hough to become one of the five doula trainees in Baltimore. Training the initial group of Baltimore doulas cost about $5,000, Tuck said. She hopes to find thefunding to train many more. The cost of hiring a doula varies widely, from as little as $100 to as much as $5,000, according to Ammann. There is generally no insurance reimbursement for doula services. Unlike New York, Baltimore will not pay the doulas for their work, so any money they make will come from clients.